Among my great loves of coconut and lemon, resides an equally great love for chocolate. And even more important, being a mother, my son loves chocolate; chocolate pie, chocolate chip cookies, chocolate fudge brownies, etc. Kids are so great. When my husband and I prepare to go camping, I usually do some cooking and baking ahead of time. The last time we went, I made the Frosted Flake Chocolate Chip Cookies and when my son came home from work the night before we left, the cookies were cooling on the countertop. He said “mom, do you realize every time you go out of town you bake cookies? Are you afraid I’m going to forget you while you’re gone?” I had to laugh. “No,” I said. “I bake because I like to eat them while we are gone.” Really hated to burst his bubble. 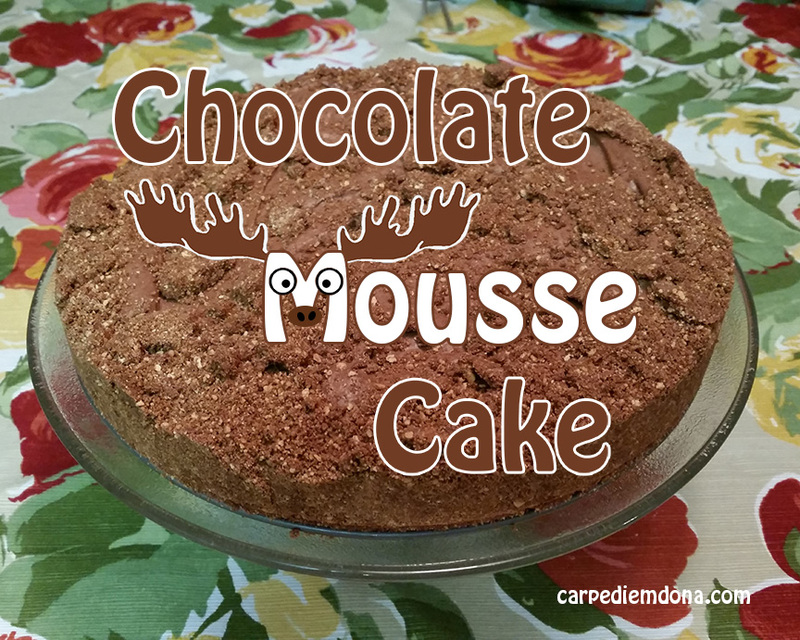 I came across a recipe for a Chocolate Mousse Cake from one of the websites that I follow and I decided this cake would be my Saturday morning dessert fix. Unfortunately, I found several problems with the recipe as it was written. My adapted recipes follows. One question I had when I first read through this recipe was the use of raw eggs. How could it be safe to eat this dessert with raw eggs in it when you aren’t even supposed to eat raw cookie dough? (Yeah, like that never happens). Turns out that because of enhanced government protocols of egg producers in the last twenty years, the chances of getting salmonella from eggs commercially processed in the United States is relatively low. Egg processors wash their eggs in chlorinated water which kills bacteria and unless the shells are cracked or have come into contact with other decontaminates, you should be fine. I washed mine again just to make sure. The next next time I make this dessert, I may omit the eggs entirely and just go with the whipped cream. 1. For the crust: combine graham cracker crumbs, sugar and melted butter in a large bowl and mix until combined. 2. Pour 2 cups of the crust mixture into the bottom of a 9″ springform pan and use your hands to press it into an even layer on the bottom and up the sides. Reserve ½ cup crumbs for garnish. 3. Refrigerate crust until ready to fill. 4. For the mousse: place chocolate and butter in a large, microwaveable bowl and microwave at 20-second increments, stirring in between, until chocolate is melted and smooth. 5. Set chocolate aside until cooled, but still liquid. (Mine was very thick). 6. In a medium bowl, beat egg yolks with sugar and vanilla, until frothy, then vigorously whisk mixture into the cooled chocolate. 7. In a large bowl or mixer, beat egg whites until stiff peaks form, 5-7 minutes, then gradually (and gently) fold egg whites into the cooled chocolate mixture until incorporated. 8. Rinse and dry your mixing bowl, then beat heavy cream on medium speed until firm peaks form. Gently fold into the mousse until incorporated. 9. Pour chocolate mousse into your chilled graham cracker crust and place in the refrigerator for 2-6 hours. 10. Release from pan, garnish with reserved graham cracker crumbs, and serve cold. To download a PDF of this recipe, click here. Recipe adapted from Chocolate Mouse Cake from 12tomatoes.com; however, there were a number of problems (errors?) with that original recipe.